Saturday, May 30th from 6 - 8 pm. 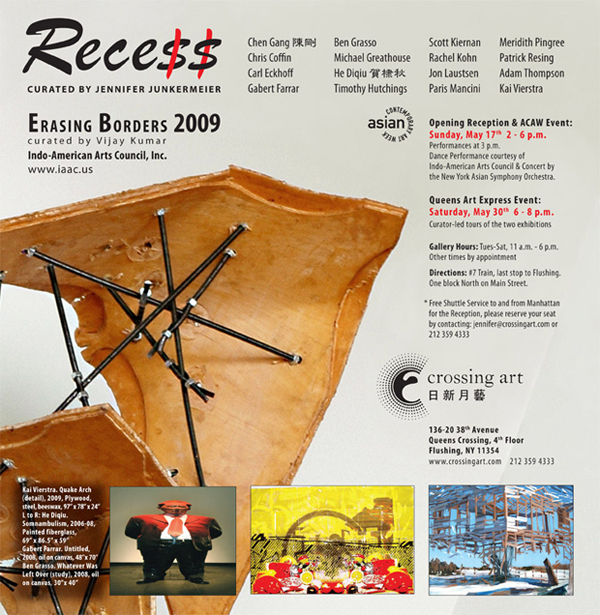 Crossing Art is pleased to announce its participation in the Queens Council on the Arts annual Queens Art Express event. Hear the curators, Jennifer Junkermeier and Vijay Kumar, in conversation with the artists in the exhibitions as they discuss the themes of the exhibitions in conjunction with the individual artists themes, directions, influences and processes. All attendees are encouraged to ask both the artists and curators questions and be a part of the dialogue. This Spring, the City's most diverse borough will host six days of exhibitions, performances, and special events clustered around the No. 7 train highlighting the distinct venues that call Queens their home, from Crossing Art in Flushing to Socrates Sculpture Park in Long Island City, even alternative spaces like neighborhood sidewalks and train stations will be prime spots for curated shows. All locations are conveniently near No. 7 train stops. For 3 weekends between May 29th to June 14th 2009, ride the No. 7 to the Queens Art Express - very cool art at over twenty art spaces that define the quintessentially Queens cultural landscape- all on a MetroCard! Visit http://www.queensartexpress.com for map, updates and information.